Don’t Miss Elephant Revival, Cicada Rhythm, & Nora Jane Strutters | TONIGHT at City Winery! City Winery is bringing Nashville a real treat tonight, Oct. 27; Elephant Revival will be playing live with Cicada Rhythm and Nashville’s own Nora Jane Struthers opening. The show gets started at 8 p.m., with doors opening at 6 p.m. This is an all ages show, and it will be a wonderful venue to get comfortable with the elegant and melodic folkies of Elephant Revival. Grab your $15 tickets here, and read on to hear more about the bands. On the verge of celebrating a decade of making music together, the quintet Elephant Revival just released a live CD/DVD set Sands of Now recorded from their two night stand at Boulder Theater. 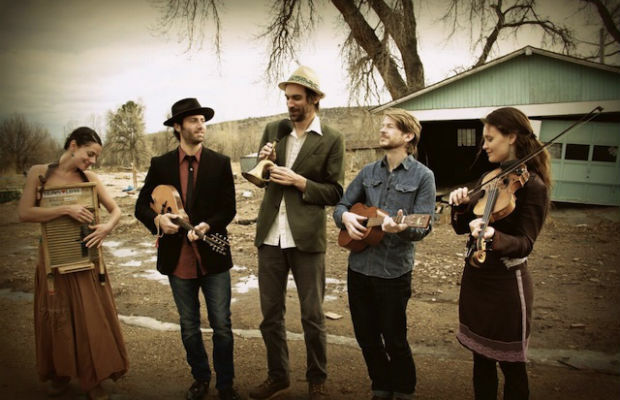 Hailing from Colorado, this Americana folk band weaves Celtic rhythms and old time gypsy music into their sound making them at times subdued while at others rustically upbeat. NPR gave the band accolades citing their “intuitive rhythms” and “haunting vocals.” These multi-instrumentalists are extremely talented and innovative, layering their sound with a wide range of instruments: from your common guitar, bass, banjo, mandolin, and fiddle to the unique sounds of a washboard, djembe, stomp box, and musical saw. I can guarantee you haven’t seen a band like this one. Growing up in Georgia, Andrea DeMarcus and Dave Kirslis have heard folk music, but as Cicada Rhythm they have taken their own slant with it. With Dave’s fingerpicking guitar and twangy voice coupled with Andrea’s classically trained bass and vocals, this duo is very dynamic. With their unbridled enthusiasm and chilling harmonies, Cicada Rhythm modernizes folk music in a way that is uniquely their own. Our very own Nora Jane Struthers will also play. If you haven’t heard of her, I predict you will very soon. She is one of those born storytellers of the old traveling troubadours of the past. Having just released her new album Wake, she is on the way up and out of here, so catch her locally while you still can. She will be joined by multi-instrumentalist Joe Overton. Elephant Revival, Cicada Rhythm, and Nora Jane Struthers will perform tonight, Oct. 27 at City Winery. The show is all ages, begins at 8 p.m. (doors at 6 p.m.), and tickets are available for $15. Ione is a barefoot hippie/cajun/hillbilly raised in the hills of the Ozark Mountains. She currently resides in Nashville and is working on her MFA at the University of the South.